No place like a homestay | Where to next? 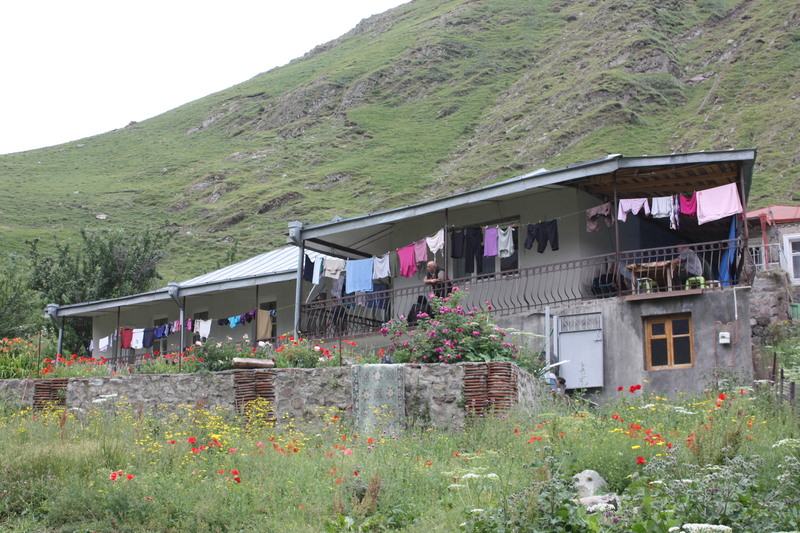 Nazi (pronounced Nazee) Homestay in Kazbegi. After a very rugged drive along the tail end of the Georgian Military Highway, we arrived in the mountain village, Kazbegi, for a few days. We’d had quite a few bush camps in a row, so were thrilled to learn that Lu, our tour leader, hoped to organise homestay places for us. Imagine turning up unannounced in a sleepy mountain village with a truckload of people and expecting to find more than 20 empty beds! Well. Lu did it. We’re all in the Nazi (pronounced NA-zee) Chkareuli Homestay—and they have room for even more. I think there were almost 40 there on our last night, but about 10 were in tent. Nazi’s is top of the list in the Lonely Planet and it’s easy to see why. Good prices, great food, fantastic scenery and lots to do. Our small room is in the centre of the house. We go through a dorm room for nine to get to it, and there are no outside windows. That said, it is comfy and very easy to sleep late because it is so dark. Poor John and I were lucky to get this room for two which we refer to as the library (sounds like a good spot for a murder). Our little library room—so appropriate for Poor John’s love of reading. The truck pays for our accommodation in these circumstances, but we buy our own food. We’re getting three meals a day here for less than A$10 a person—and the food is delicious and plentiful. What a bargain and what a treat. Dinner the first night was tomato and rice soup, garlic chicken, salad and bread. The soup and chicken were authentic Georgian recipes and both were superb. Our hostess, Nazi, shared her recipe for the soup with me, but recreating it at home will be nigh on impossible. It calls for a special spice mixture, known in Georgia as harchoos sunelli (or something like that). It’s sold pre-packaged and she’s not even sure what’s in it. I guess I’ll have fun trying to track it down or figure it out. 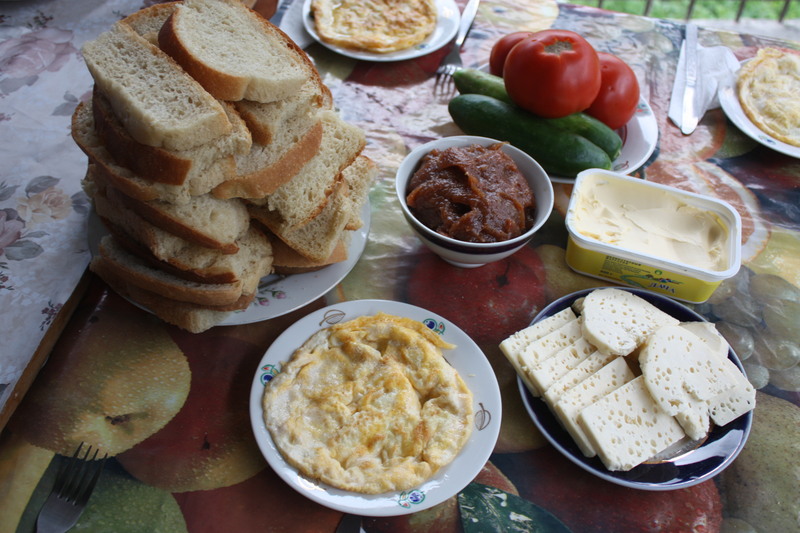 Breakfast is just my kind of food—one day a small omelet accompanied by tomatoes, cheese, salami, cucumbers, bread, jam (I was sure it was quince, but our hostess says it is a mix of apple and plum). This morning we had pasta with egg and cheese in place of the omelet. I ate mine and a bit of someone else’s. Can’t wait to see what we get tomorrow before we set out again. Lunch is a make-it-yourself affair from the breakfast table. There’s a 6-kilo washing machine too, and I sent a load through this morning. Only cost A$3 including the soap powder. I hung everything on the balcony and with the most-welcome sun and warm breeze we had today, it was all dry within a few hours. Oh, and there is internet, but plug-in only, which doesn’t work with my little laptop,. So I need to save files and pics to a thumb drive and transfer to their computer. It’s working—sort of. I can’t get my photos to load. If you see pics with this, I’ve cracked the conundrum or finally reached a WiFi outlet. 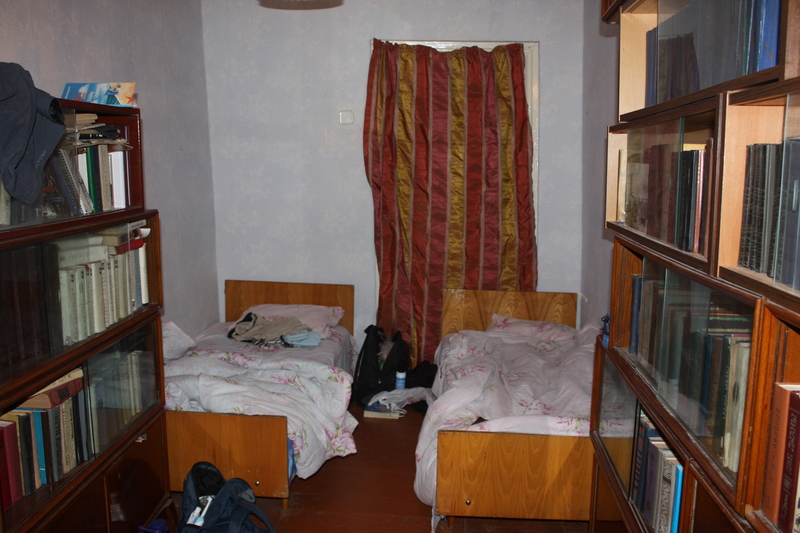 If you ever want to book this homestay—and I highly recommend it—you can call on (+955) 598 382700 or (+995) 345 252480, or email Nazi’s daughter Shorena on ssujashvili@yahoo.co.uk (the phone numbers changed recently so if you can’t get through, use the email address). Nazi is serious about running a great homestay. The night before we left, she received five new mattress. She told me some of the current ones needed to be replaced. Eating local foods is one of the great things about traveling to foreign countries…. Nice that you had a bed to sleep on (picture showed on the screen), instead of a mat in a tent…. Oh wow, Sy. Thanks for that URL. I’m sure it will come in handy. A short walk in the Georgian Caucasus « Where to next?